Western blot analysis of whole cell lysates probed with IKK beta antibody followed by detection with HRP conjugated Goat anti Mouse IgG (1/10,000, STAR207P) and visualized on the ChemiDoc MP with 20 second exposure. Arrow points to IKK beta (molecular weight 99 kDa). IKK Beta antibody recognizes the inhibitor of nuclear factor kappa-B kinase subunit beta, also known as I-kappa-B kinase 2, I-kappa-B-kinase beta, IKK2, IKK-beta, or nuclear factor NF-kappa-B inhibitor kinase beta. The antibody has been extensively validated for western blotting. Mouse anti Human IKK beta antibody recognizes the inhibitor of nuclear factor kappa-B kinase subunit beta, also known as I-kappa-B kinase 2, I-kappa-B-kinase beta, IKK2, IKK-beta or nuclear factor NF-kappa-B inhibitor kinase beta. The protein encoded by IKBKB gene phosphorylates the inhibitor in the inhibitor/NF-kappa-B complex, causing dissociation of the inhibitor and activation of NF-kappa-B. The encoded protein itself is found in a complex of proteins. Several transcript variants, some protein-coding and some not, have been found for IKBKB (provided by RefSeq, Sep 2011). 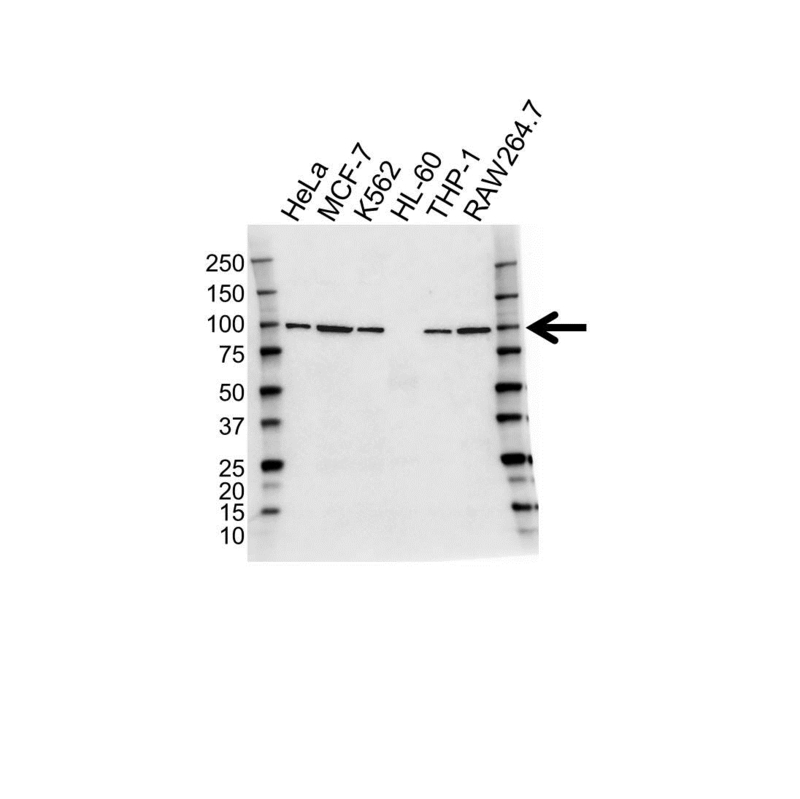 Mouse anti Human IKK beta antibody detects a band of 99 kDa. The antibody has been extensively validated for western blotting using whole cell lysates.